Increasing amount of black money is one of the big problem for Govt. of India. A major portion of black money is used in Real Estate business in India. This black money is impacts adversely Indian Economy. To curb the use of black money, Govt. of India introduced the provision of TDS in sale and purchase transactions. What is TDS on Immovable Property? Value of Immovable Property needs to INR 50 lacs or more. If value is less than INR 50 lacs, this provision is not applicable and you need not to read this article. Property needs to be Immovable but other than agricultural land. TDS rate is 1% on total sale value. It means if value of immovable property is INR 60 lacs. Buyer need to deduct TDS on INR 60 lacs which come to INR 60,000/-. TDS is to be deducted by Buyer out of the payment to be made to seller. This provision is effective from 1st Jun-2013. All the sale and purchase transactions of Immovable Property of worth INR 50 lacs are subject to this provision with effect from 1st Jun-2013. This provision is not applicable on transactions on or before 31st May-2013. TDS is to be deducted by Buyer out of the payment to be made to seller. It is the responsibility of Buyer. There is no requirement of TAN in this case. You can read my previous article to read more about TAN. PAN of seller and buyer is mandatory. If they do not have PAN, they need to apply one before entering into purchase and sale of immovable property. You can read my post on How to apply PAN. What to do with this TDS amount? One need to deposit this TDS amount to the account of Govt. of India. Buyer needs to deposit this amount to the account of Govt. of India. How to pay TDS amount to Govt. of India? One need to fill up the Form 26QB and deposit the amount in the bank along with this Form. One can also fill up Form 26QB by visiting NSDL website and pay TDS amount online. After filling up 26QB, you will get acknowledgement no. which you can use to pay TDS offline. In case you forgot to note that acknowledgment no., you can go to NSDL website and enter the basic details for verification and you will get the acknowledgment no. What is the last date of TDS payment? 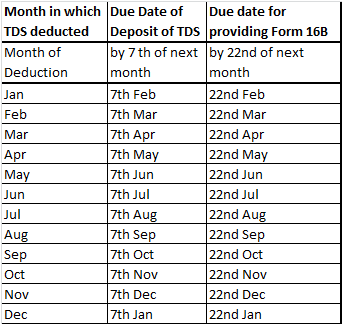 TDS needs to be deposited withing 7 days from the end of month in which TDS was deducted. For example, if TDS was deducted in Apr, last date of payment is 7th May. Please note if 7th happens to be on holiday or sunday, even then last date is 7th. There is no extension in date in case of TDS due to holidays. If TDS is not deposited by due date, interest and fees will be the additional burden on buyer to be paid alongwith TDS amount. What are the details required in Form 26QB? Name, address and PAN of buyer and seller. Details of immovable property. Value at which it is sold, date on which sold, etc. What to do after making payment? After making payment, a challan will be generated. This challan needs to be saved for future reference. After this, Form 16B needs to be provided to Seller. Form 16B is the TDS certificate which buyer needs to provide to seller in respect of TDS deducted and deposited in the account of Govt. of India. Where to get Form 16B? Buyer needs to register at www.tdscpc.gov.in as deductor and can get Form 16B online. What is last date of providing Form 16B? Registration of property will be done only after TDS challan is attached with the application of registration.